Sequels, by necessity, escalate and expand. There has to be something new to show us after introducing us to the world of the first film. How to Train Your Dragon 2 takes that idea to its very core, Expanding the scope, but focusing on relationships rather than plot. 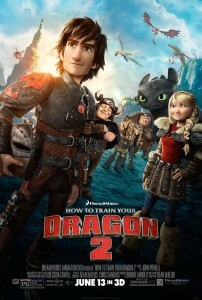 This film picks up with Hiccup (Jay Barachel), Toothless, and the rest of the main cast five years after the events of the first film. Despite being a hero to the people of Berk, and creating a whole island where dragons and people coexist, Hiccup is still uncertain about his place in the world, especially as his father, Stoick (Gerard Butler) wants him to the be the next chief. Rather than take on that responsibility that would keep him at home, Hiccup would rather explore the world and find more dragons. This brings him into conflict with Eret (Kit Harrington), a dragon trapper, and Drago Bludvist (Djimon Hounsou) who is looking to build a dragon army. Perhaps shaping his destiny even more, Hiccup discovers that his mother (Cate Blanchett) is still alive. In many ways, How to Train Your Dragon 2 is a much more mature film than the first. Where the original film was a wonderful “dog and his boy” story, with a message about reevaluating your perceptions, this film’s themes are closer to accepting what you cannot control, which keeps the story (and Hiccup) grounded in the challenges faced by young adults. This is definitely the focus of the film, even moreso than the evil plot by Bludvist, who doesn’t really show up until the final third. Dean DeBlois, the film’s screenwriter and director, is chiefly concerned with establishing the world these characters occupy, but more as an extension of who they are, rather than purely to set up future sequels. 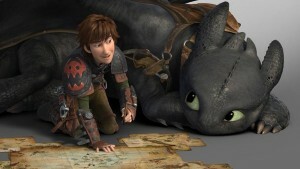 That includes populating the frame with as much visual punch and motion as possible.There are several reasons for this, including showing off the luscious animation, adding small sight gags to distract younger children during the film’s talkier sections, like the reunion between Hiccup’s parents, the most romantic thing in an animated film since Up. The visuals pack more than just adorable dragons. The flying scenes are exquisite, the action is frequently breathtaking, and the entire film is just an incredible visual achievement. This is easily DreamWorks’ crowning franchise, offering the best story and visuals of any of their output. How to Train Your Dragon 2 is a bold step forward for the franchise, rather than trying to repeat the formula of the first film, and it pays off. This is a wonderful film and perfectly balanced to appeal to both kids and adult animation fans. How to Train Your Dragon 2 opens today in Philly area theaters.